The little girl has learned to read…yehhhhhhhh. So next time I am hibernating, I shall ask her to blog hop. She has been reading small words and such for a while now but now she is onto books and she can read one on her own now. Ok, now don’t get me wrong, by “a book” I strictly mean simple books meant to be read by 4 year olds and not the Wodehouse out of my shelf. Huh your husband says that, why can’t he spend some time reading with the little one then, strange people. Now, I have never really pushed S to read just for reaching a milestone, what I actually wanted her to have is a love for reading rather than just reading. Kids learn to read by a certain age anyhow, maybe a few months early or late, but eventually they do. Many of them do not develop a love towards reading though, and then again many who do slowly loose it when other things in life demand more time. For me books have been great friends always, though it’s mostly fiction that I am attracted to. A perfectly bad day could have a happy ending for me, if I had a good book to go back to. Lately however with life taking over, I rarely got time to read for pleasure. There aren’t many people around with whom I could discuss books either, because there was no one who spent time reading fiction. On my trips to the library I am not sure what to pick up, I want to read more fiction from other countries and culture and I do not know what other recent international authors I could read. I am reading “The House of Sand and Fog” right now and I am loving it. What are some of your favorite books that could go on my reading list? Pray Share. 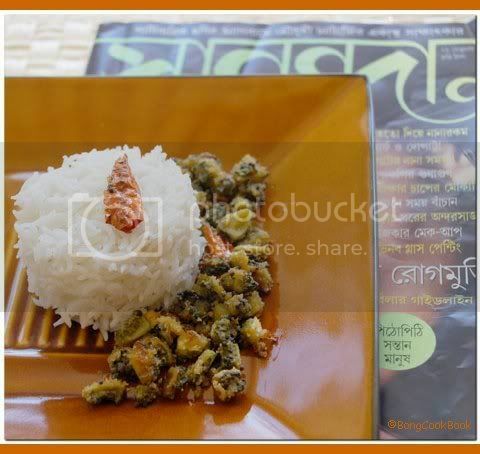 The Uchche Posto Jhuri is a simple bitter gourd recipe that I picked out from this almost famous Bengali Magazine Sananda. Sananda is to Bengal what Femina is to India. Within the slim covers of this mag you can get a good dose of advise on how to handle your MIL on your honeymoon, the best gift to give your boss on vacation, what-to-tell your maid when she wants go on a vacation and hundreds of tips on keeping your underarms sweat free and hair glistening. Armed with such knowledge, do you need anything more to confront life? 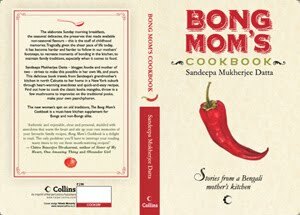 Other than this there are some good recipes and a whiff of Bengal in this far off land. Thanks to my lovely friends who gifted me a subscription of this mag on my last birthday, I am totally updated on glitzy happenings around Kolkata, even if my Ma has no clue about them. Uchche or BitterGourd is a favorite among Bengalis and as I had mentioned earlier they like to eat it bitter, they will do absolutely nothing to mask the bitterness, even if you grovel and beg. This dish has a smattering of posto (poppy seed paste) and that makes it pretty good, though bitter it still is. When the spices crackle add the bitter gourd pieces, add salt and cover & sauté over medium flame. Add a sprinkle of turmeric powder for the color. Stir till done. The end result should be dry with the poppy seed paste dry coating the bitter gourd. Wash 2 medium sized ucche aka bitter gourd. Chop into thin slices or small pieces. Next step is to roast the bitter gourd. You could do that on the stove top but I prefer microwave or oven. Microwave: Take a microwave safe glass plate and add the chopped bitter gourd pieces. Sprinkle some salt and oil and microwave for 2 minutes. Take the plate out, add some more oil and toss it around. Microwave for another 2-3 minutes. After it is done, it should be evenly browned and not burnt. Microwave suggestion is from blog Red Chilies. Oven: Preheat Oven to 350F. Toss the bittergourd with olive oil, red chili powder. Now put them in an oven safe tray in single layer and bake for 20-25 minutes until you see they are crisp. I use this version mostly. Add the roasted bitter gourd, that you have already cooked. 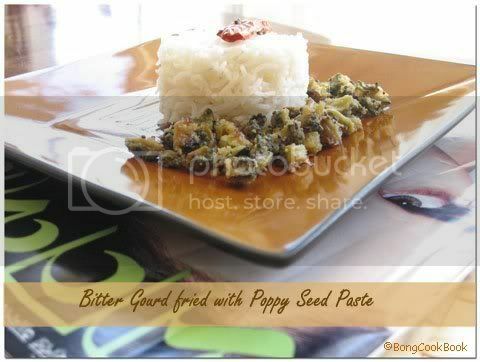 One the poppy seed paste is cooked take it out in a serving bowl. Adjust lime juice and salt. Serve immediately to retain the crispiness. Trivia: Bitter gourd is revered in ayurveda as a cleansing and purifying vegetable. It helps purify blood tissue, enhances digestion, and stimulates the liver. yeah yeah..now she tells me...I have under estimated your bong guys passion to bitter one!..I made a thali for you..ok rather we enjoyed on your sake!...made Uchche bajji!..expect the post on monday! its so nice to know your lil one is reading..i love wodehouse..I have been crazy enough to collect the whole series of that...so wish my daughter will one day have the passion to read my big collection!.. You must be so proud that little S is reading already... did you sit with her at home to teach or did they start teaching her to read at her school/daycare already? hey thats a nice spread and bitterghourd wth poppy seeds first time for me. i loved the plate also..
Nice to know lil S is reading ! It is lovely to read your posts again, Sandeepa. Recently, I have been reading books from the "Ladies #1 Detective agency" by Alexander McCall Smith. Set in Botswana, these are simple and heart-warming tales of a woman detective's life. Plus, they are set in Botswana, Africa and give a glimpse of another land and another culture. If you have not read Rohinton Mistry, his "Tales of Firozsha Baag" is a wonderful read...short stories that you can savor one at a time. Amy Tan's fiction speaks of two themes: Chinese life and the chinese immigrant perspective, and of mothers and daughters. I have enjoyed her books, such as the "Joy Luck Club". All of these books should be easy to find in your local library. nice LIL S starts reading ..and soon she will blog hop for u too LOL ..reading all your sweet posts , and thinking how much little things of hers remained joy to her mother forever.. I am going to try this recipe when I get some good bitter gourds. That is where our cuisine differs I guess we do everything to mask the bitterness. Lovely post! Reading does open up so many worlds. Still I'd trade a book for that dish at the moment. I just finished "Half of a Yellow Sun" by Chimamanda Adichie, which is worth a look if you're interested in things African. Hardly Wodehouse, though! Nice post there, San! I'm glad that little S is developing a love for reading. I have been a voracious reader all my life but same as you, I have not had time to just relax with a book in AGES now! When I was on bed rest before M's delivery, I read tons of books (that kinda makes up for the draught now!). I loved the Kite Runner (cried buckets too!) & am currently "trying" to read a book called "Eat, Pray, Love" that is interesting. I hope to complete it at least in the next month or so!! My niece of age 3 has many story books . which who ever is around her reads for her. she showed me all her books when I visited her and when I asked her to read one for me. As she don't know reading yet, told me that she will read it for me tomorrow :) . I chuckled at her wit. Glad to read here about S .
Husband says so.... Oh I hate that too.. and such people who can bifurcate work of husband and wife. Oh and that lovely dish is for VoW thank you Sandeepa :) . I just learned that bitter gourd is cooked in bengali dishes many diff ways...Well yo uwill see what i am making of it in next week. btw, as i see that you haven't added RCI-bengal to TOI , I just suggested a feed on your behalf.its showing there now. Send the email soon with your entry :) .Hugs to you. Reading, i didn't really teach her. There is a site called www.starfall.com which helps to understand the phonetic way of reading. I would just encourage her to read every thing we came across, like on the road, stores, at home. I guess we have similar reading tastes. recently I too read the "Ladies #1 detective agency". But I read only the first one, haven't tried the rest. Haven't tried the Rohinton Mistry yet. We too do uchche bhaja with turmeric and salt, but we don't add any other spices like I have seen in many South Indian bitter gourd recipes, right ? Ar hyan Sananda online order korle barite diye jay, dam ta prochur ney. When the kid is exposed to many books or small library. They start reading very quickly. It happened to my kid,he is in 1 rst grade and he shines above his level. How true, the pressure on parents and kids is immense! But really nice of you to not push lil' S into milestones. I'll lap up this reipe, love bitter gourds :). i have enjoyed reading most of Rohinton Mistry's work (i completely agree with Nupur about Tales of Firzosha Bag), Hardboiled wonderland and end of the world (Murakami), Ice Candy Man (Bapsi Sidhwa), What the body remembers (Shauna Singh Baldwin) etc-there are so many more. But if you ever think about reading non-fiction, i would stronly recommend Oliver Sacks and Paul Broks. i really don't get the need to mask the bitterness of bitter gourd. eat it if you like it bitter, else leave it alone. i will surely try out this dish. i love non-fiction - boring journalistic stuff. oh..I was just going to suggest stuff by Alexander McCall Smith when I saw Nupur's comment..I started with the No. 1 ladies Detective Agency which I probably like the most..I also liked the Isabel Dalhousie series (Sunday Philosophers Club).Also enjoyed the Scotland Street series..
My other (not so light) favourites are:Kundera's Unbearable Lightness of being, Murakami's Wind up bird Chronicle. Also enjoyed Byatt's Possession(I could go on..but will stop here). had a good time reading this post Sandeepa ....asking your daughter to blog hop...that part i was laughing out loud:D.I love reading fictions..recently i am addicted to Chitra divakaruni banerjee.here in Moscow i miss the bitter gourd..back home mom used to make once in 3-4 days...the posto jhuri looks awesome...nice pic. Doesn't matter . As fas as finally it appears on TOI now :) . Haven't got your email for entry .Did you send it ? I second Lavanya's votes for George Eliot's Middlemarch (my favorite book of all time, ever; I re-read every couple years) and A.S. Byatt's Possession (fantastic- a literary thriller!). I'd also add anything by Anne Tyler, my favorite contemporary author. Her latest, Digging to America, is wonderful. Other favorites are Patchwork Planet and The Accidental Tourist. She has a wise and gentle sense of humor, and lovely insights about people and their lives. PS The Uchche posto looks great; I love posto. I try to take any oppurtunity to flog Canadian writers so here goes. I thoroughly enjoyed and would highly reccomend M.G. Vassanji's 'Inbetween World of Vikram Lall' and 'Assasins Song' two books that tells fascinating life stories of the Indian diaspora. Another of my perrenial favourite is Anita Rau Badami's 'Hero's Walk' and 'Tamarind Mame'. Enjoy. that looks very interesting sandeepa... I was going to post alu karala bhaja aar mushurir dal... :) is there still time? have u read khalid husseini's the kite runner? the best novel i have ever read. i am not getting time to read books these days and i have been reading same books over and again. love you picture, great recipe and simple too. Hope you will try them but Alexander McCall Smith is my favourite at this moment if you like feel good books. I tried this as i love everything that has posto as it's ingredient and it was awesome. Thanks for such a wonderful recipe.